This summer I had the opportunity to study abroad in Cyprus. For those who haven’t heard of this country, here are a few facts. Cyprus is the third largest island in the Mediterranean, has over 300 days of sunshine a year, and holds a rich cultural history. Although the majority of the island celebrates its Greek heritage, the northern section of the island has Turkish roots. 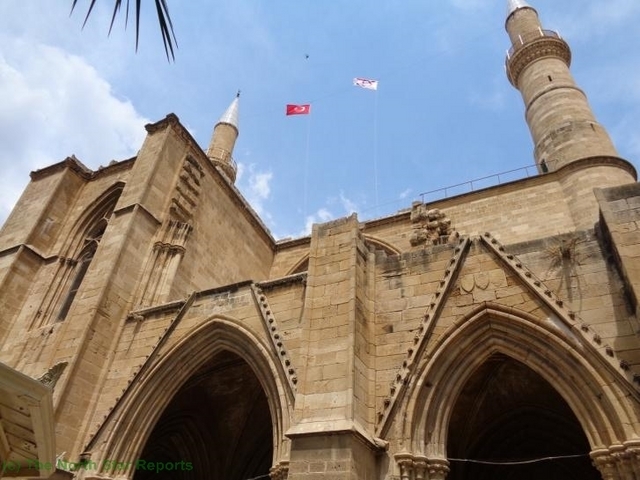 During the majority of my two months in Cyprus, I stayed in the capital, Nicosia. Nicosia is the only divided capital city in the world. It is where those with Greek heritage and those with Turkish heritage are divided due to the Turkish invasion of 1974. When I made the decision to study there, I did some research on the border called the Green Line that separates the country of Cyprus. I also read about the Turkish invasion, but it wasn’t until I actually got to Cyprus that I learned in depth about the invasion and its impact. At the beginning of my Cyprus trip, I took a tour of what was called the old city (the older and more historic area of Nicosia). During that tour, our guide told us about the invasion. The Turkish army invaded Cyprus causing many to lose their lives and northern Cypriots to flee to the south, abandoning their homes and all of their possessions. After the invasion, a border was put in place to separate the North and the South. It remained closed for some forty years until reopening in 2003. During the tour of the old city, I had the opportunity to see the border of the Green Line as well as the United Nations buffer zone that separates Cyprus from the Turkish occupied area. Also in the old city is a border crossing zone where one can cross from Cyprus over to the Turkish side of the island. Although Turkey considers its position in Cyprus to be legitimate, the rest of the world considers it an illegal occupation. Therefore, when crossing over, one enters an illegal area. In this occupied area the laws of Cyprus and the help of the US embassy do not apply. Although the thought of entering this occupied area may seem a bit unnerving, I had the chance to cross over many times while in Cyprus. The first time a group of friends and I crossed the line we were all a bit unsure of what to expect. 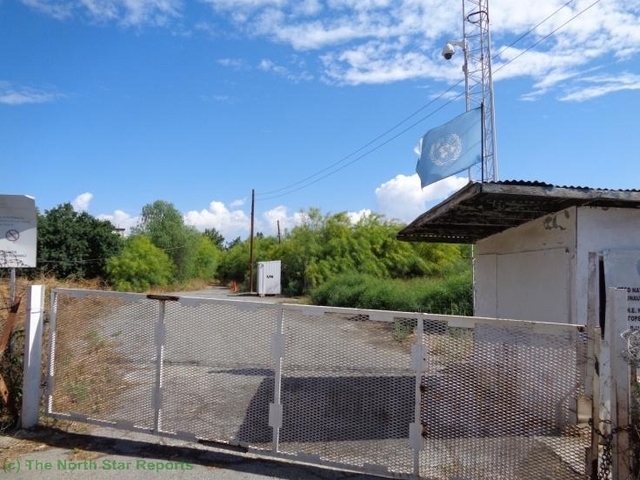 After all, it’s not every day that one passes through a United Nations buffer zone to enter an area illegally occupied by the Turkish army. 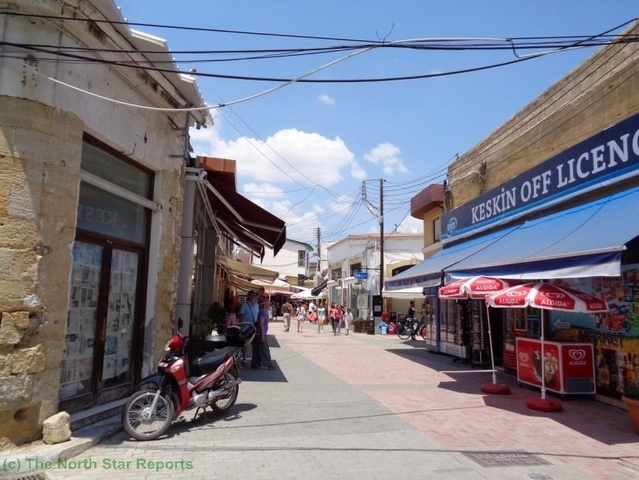 We entered the North at the Ledra street crossing where we showed our passports on the Southern side, walked a few yards through the buffer zone, and then had our passports scanned again by the Northern officers. After learning about the invasion and being warned about even taking pictures in the military area, I was surprised by how relaxed the crossing was. The Turkish officers were very friendly and were even joking with us as we checked in and out. Once we successfully crossed the Green Line, we got to enjoy the best of both worlds so to speak. On the Turkish side of the island, we found great food, souvenirs, and sites. The North also uses Turkish Lira instead of the Euro, so purchases were less expensive. Although most of my summer was spent in Cyprus, crossing the Green Line gave me the benefit of taking a trip to “Turkey” in a few short minutes. Did any of the locals talk of resolving the disagreements between the North and South, and thus having a standard, undivided capital? This seems to be a common, reoccurring theme throughout history– two parties disagree because they have for generations, despite not actually knowing the reasons for their hatred and disputes. Could you see yourself living there for a full year? I can’t imagine how different the culture and landscape must be from Minnesota, especially Duluth. However, it would be incredible to travel there at some point, and I love the photos. Was there a tension at all between the two sides that was evident? After all these years I would be curious to see the difference in the people between now, and back when the invasion occurred in 1974. Also, it is the 3rd largest island in the Mediterranean, but how does that balance between Turkish and Greek culture? Given the place this occurred this must have been so cool to experience and it seems unlike anything we could experience in the United States. Really interesting! I am wondering if there remains any bitterness in those living in the south. In addition, considering the fact that only Turkey considers their occupation of the Northern part of the island legal, will there ever be any action taken against them? Or is there any pressure from other nations to withdraw from the island? Thanks for an interesting article about an island of which I previously knew only the name! The experience you received with this trip seemed to be very compelling for you. Do you feel that because you were from the U.S., it was more comfortable for you to cross though the buffer zone? With it saying that the Turkish community is illegally withholding half of Cyprus is there any course of action to return Cyprus to its past state? Overall it seemed to be a great trip for receiving great cultural views and understanding a conflicted history within the city of Cyprus. What prompted the allowance of passing between the two sides in 2003? Has the tension gone down that dramatically since 1974 and/or was there a regime change on the Turkish side of the Green Line? As the tension continues to decrease I wonder how long it will take before the Turkish government would allow the people of Cyprus that abandoned their ancenstral grounds during the invasion. Or will it never be possible for the people of Cyprus that were affected by the displacement in any form to ever forgive the Turks? By your own personal experience would you say that the youthful generation of both sides would be willing to mend the island in any way in the future? First off, what an amazing place to see! It is interesting that a “Greek”-Turkish border is guarded and divided to such an extent in one area of the Mediterranean while the sea crossing from Turkey to Greece is the scene of one of the largest migrations of people in recent history. Is the UN ceasefire line and border crossing sustainable? If so will it continue to become more relaxed over time as it already has been since 2003? Maybe someday soon there will be a tearing down of the wall reminiscent of Berlin in 1989 and the re-unification of Cyprus by peaceful means. When you cross the border what laws apply then; are the only laws in existence Turkish laws? It is interesting that you had no problems crossing the border, even with the warnings and strained relationships between both sides. Is there a wall extending the entire length of the border through the whole island or is it just in the capital? This will be something to watch for in the future if conflict or peace ensues in the years to come. I also learned about the divide Cyprus last year in Europe Today, but I am surprised by the lack of out right violence. What we had learned was that the buffer zone was there because there had been (and still are) so many attacks from both sides, yet there appears to be a rather easy peace. I wonder if this is was intentional on the part of the articles we read, if they make the Turkish into violent people all the time it can most certainly cause unrest on both sides. Doing this would certainly push a reunification off, as Matt Breeze mentioned in his comment, considering the history between the Greeks and the Turkish (on Cyprus and other issues) a reunification of any kind seems fairly unlikely. I’m in awe of the experience you had! It’s incredible that there is such a divide, yet very few people are informed of it. I was particularly impressed that while there is such a divide, the Turkish side was not only able to be accessed, but the soldiers stationed were friendly and lighthearted. It will be interesting to see if the divide is ever destroyed. That is so cool! I have heard about Cyprus, but I never knew that it was split into two sides. It’s also interesting that both sides use the same currency even though they think Turkey is technically illegally occupying the area. I must say this is definitely going on my bucket list. One question that came to mind while reading your article was Is there hostility from one side to the other? ( Like the Packer vs. Viking rivalry) Was there a strong military presence out on the streets? Did you think one side was more respectful than the other? Great Article! Very cool piece. The idea of legitimacy came to mind when I read this passage: “Although Turkey considers its position in Cyprus to be legitimate, the rest of the world considers it an illegal occupation. Therefore, when crossing over, one enters an illegal area.” That being said, I would also expect the rules to be stricter and guards at the buffer to be more concerned. Thanks for writing. Before your posting, I truly had no idea Cyprus was spilt into two. I’m curious, in your experience did you find your citizenship a protectant within an UN-free zone? I can’t imagine what that displacement would be like. In the 21st century, in the US, it’s hard to believe that there are still such tense environment. What a unique experience. Something I’m curious about is the Lira: is Turkey’s currency going the same route as Greece’s? Or is it actually flourishing on it’s own separate from the Euro? Turkey has always been one of those far off places that I personally do not think too much about. However, the amount of history you found here is incredible. I actually have never heard of Cyprus, and if I have, it’s not been something I looked into very much. It’s so interesting to hear about these kinds of old conflicts that went on. How interesting. I have a family member working in areas of the world extremely protected by the United States government and I have always wondered what it would be like when they take a step out. The tension in the initial crossover must have been largely unnerving. Did you have second thoughts? When you first researched it what kind of material did you find regarding the crossover? Where people ready, willing, and able, or more afraid? What an experience! I did not know such a place existed. I knew about the island, but not its colorful history and current state. It is amazing how peace has prevailed when the opposing forces live so close to each other. I wonder if the people from the north or south have the same freedom to move through the border like you did? It is amazing how a country can have a different viewpoint on an issue than the rest of the world. Also the border situation sounds very interesting. rather than being formal and strict the way it often is here it sounded like you had an enjoyable time passing through especially into an illegally occupied territory. Were the people noticeably different from the north to the south or no clear difference? This is such an interesting story, and I am glad you have shared it since this region is currently in the news. I had no idea that Cyprus was split into two, and I find it extremely interesting that it is, especially with the border situation. It is amazing that one country can have a completely different viewpoint than the rest of the world,and it reminds me of what is going on in the South China Sea currently. Nice job! Like what has been a prevalent topic talked about it class, I personally cannot imagine having my home being under attack and having to leave for that reason. Attacking an innocent person’s community which results in them taking all their belongings and moving to a completely differnet place seems inhumane to me. It also surprises me how it was talked about that crossing the border was so relaxed. When I think of crossing borders I have only heard horror stories, or strict and stern rules that must be followed or there will be consequences. So hearing that the guards were the opposite of that and appeared to be having a good time is something that makes me happy. Greece looks like a beautiful place though, and visiting there would be amazing. I have always wanted to travel to Greece. I am glad you got to study there! I thought it was very interesting that Cyprus was divided from the north to the south — I was not aware of that! Were the two sides pretty different? I find it fascinating that borders can do so much with separating people and basically let them live completely different lives. I am glad that crossing the line went smoothy with the Turkish army. I would probably be freaking out!!! Wow! That sounds like a very interesting trip! I wonder how the Turkish were able to take over that area of Cyprus? Is the Cyprus army or government planning on taking any action to remove the Turkish? Interesting how those in Cyprus were very worried about the crossing. Sounds like a great educational opportunity to be immersed in a culture with an ongoing conflict such as this, learning about the UN barrier and how those in Cyprus have been more in tune to Greek culture or Turkish culture. Thank you for sharing your story.